Just like it takes a whole village to raise a child, it also takes a LOT of people to keep a Kinship Home functioning! There are way more people in each of our Kinship Homes then you might even realize. First there’s the caregivers. You’ve probably heard about them, because they do so much we can’t help but brag about them! These widows live with the children in the Kinship Home, and are loving mamas to all of the kids. The caregivers are our heroes for the way they take care of children with traumatic pasts, helping them through the day-to-day issues they face. But they can’t take care of 20 kids all on their own! So who else helps every day at each Kinship Home? Security guard who protects the grounds making sure everyone at the Kinship Home is safe. Cook who helps the caregivers with making the meals for the children. When you have 20 kids to take care of, that’s a lot of food to make! Driver who takes the caregivers into town if they need to get something for the home. And takes the children to the doctor when they get sick. Laundry worker who cleans all the clothes, sheets, and towels for 20 kids and all the caregivers (and you thought you did a lot of laundry)! Housecleaner who keeps the Kinship Home clean and livable. Each of these men and women live within the surrounding community and are blessed to serve at the Kinship Home. By employing people from the local area, each Kinship Home has an even larger impact on its community. They can both share the gospel with these people and give them an opportunity to support themselves and their families. Robai is housecleaner at the Ephraim Kinship Home in Kenya. She is a mother of five children and lives with her husband and children nearby the Kinship Home. Robai’s husband is a small scale farmer who has always worked hard. Back in 2011 their family was in a dark place financially, so the Ephraim Kinship Home gave Rabai a job to help the family make ends meet. She has been working there ever since! Every day, Robai cleans the Kinship Home grounds, the church, and the children’s rooms. Robai takes her job seriously and makes sure she creates a clean and comfortable environment for the children who live there and any visitors who come by. Robai comes early to the Kinship Home each morning. 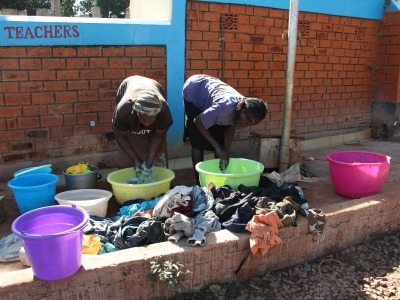 She helps the caregivers get the children ready for school and after she has seen them off, she gets started on her housecleaning for the day. But Robai’s favorite part of the day is when the children come home from school and she can spend an hour playing with them before she heads home. Robai loves her job and is so thankful for Ephraim Kinship Home for giving her this opportunity. Because of this job Robai is able to help provide for her family and send her children to school. But even more than that, this job gives her joy because she is able to love on the children in the Kinship Home. It’s amazing how the impact of the Kinship Home and the community work together. Without the help of the community, the Kinship Home wouldn’t be able to function. And without the Kinship Home, their neighbors would suffer without hope and for some without a reliable income. It really does take a village to raise a child! 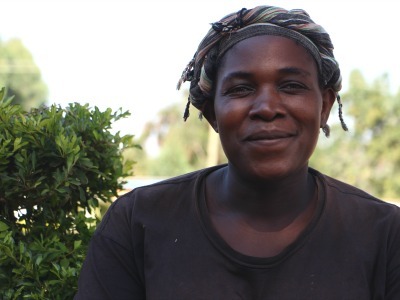 Robai and her village are proof of how this works with the children at Ephraim Kinship Home.